At the beginning and end of the day, my mind is capable of entertaining only the most basic of tasks. Luckily for those I come into contact with, oral hygiene is something I can take care of on autopilot. Even if you incorporate flossing and rinsing with mouthwash into your regimen, the key activity is a simple one: put paste on stick; put stick in mouth; move stick around. But think of all that data going to waste; you're not exactly keeping tabs on the precise length of your brushing session when you're staring, bleary-eyed into the mirror on a Monday morning, now are you? That's where Oral-B's SmartSeries, app-connected electric toothbrushes can lend a hand, logging that info for your scrutiny so you can modify your habits accordingly. If that already sounds like a gratuitous feature for a toothbrush to have, then you're on my wavelength. I'm not against the concept -- there are scenarios where I picture an app-compatible toothbrush being somewhat useful -- but Oral B's initial efforts feel like an excuse to tack on a gimmick and make an expensive product even more so. Depending on which side of the pond you live on, Oral-B's "smart" brushes are known by different, essentially meaningless handles. In the US, you've got the "Pro 5000," and in the UK the "Pro 6000" and "Pro 6500." The higher the model number, the more arbitrary additional features, such as a tongue-cleaning mode (because, duh, you need a special mode for that). Aside from these minor distinguishing factors, all use Bluetooth radios and work with the Oral-B app for iOS and Android. Electric toothbrushes are way more expensive than their manual counterparts in general, but Oral-B's SmartSeries are the cream of the crop, and are priced as such. 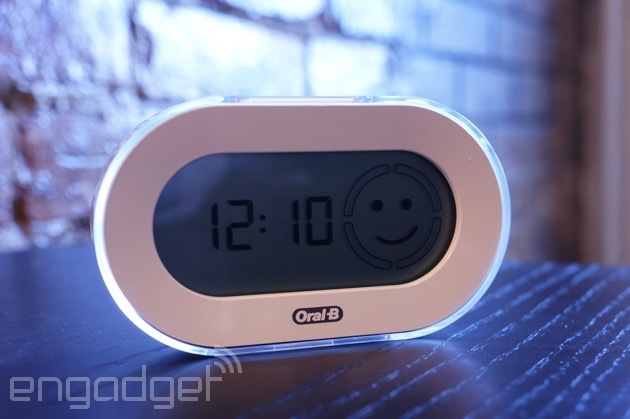 At launch, Oral-B expected you to pay $160 or between £230 and £250; now, though, they're going for discounted prices on sites like Amazon, probably because sensible people simply aren't willing to pay upwards of 150 bucks for a toothbrush, Bluetooth or not. Credit where credit's due, though: The Oral-B app is very well-designed, with every feature and setting you could possibly dream of. A session timer is the first thing you see when you boot the app up. Pair the toothbrush with your phone via Bluetooth 4.0, and the application will start the timer when the brush head starts spinning. By default, you're committing to a two-minute session, with the app telling you which quadrant of your mouth to scrub for 30 seconds at a time, and when to ease off if you're putting too much pressure on your gnashers. A separate pane on the timer screen also tries to keep you occupied with a customizable range of content, like brushing tips, news, weather info, calendar appointments, quotes and pretty pictures, as well as on-device photos and videos. You can increase the amount of time you're told to spend in certain areas of your mouth, should anywhere need special attention, and you can also instruct the app to remind you to rinse, floss and clean your tongue once you're done brushing. Confirm you've completed these tasks, and they'll be logged as part of the overall session data. Beyond the timer, though, there are plenty of other nooks and crannies to explore. 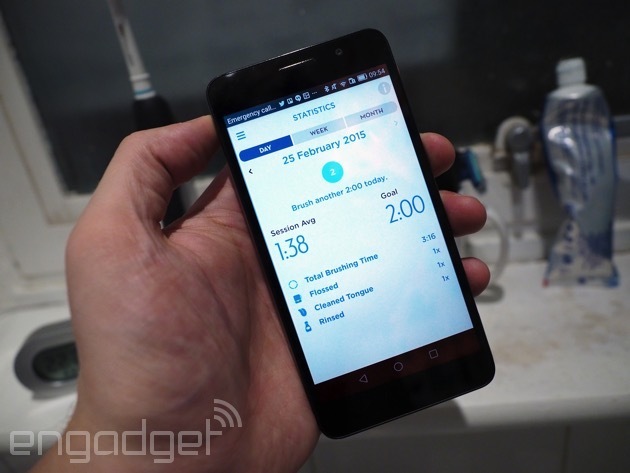 From within the app, you can enable brushing and head-replacement reminders, as well as tinker with toothbrush settings like changing the mode from "whitening" to "deep clean," for example. There's an exhaustive list of oral hygiene tips to work through, and a store that'll point you in the direction of Oral-B toothbrushes and replacement heads. You can add the details of your local dental practice -- manually or using intel fed by Google Places -- so you can contact them from inside the app, and plug in appointment dates for later referral. If you have a spare few minutes with your dentist after a checkup, you can get them to set up a "Professional Care" plan, which involves fiddling with reminder and timer settings. Then there's the crux of the entire proposition: statistics. The app logs when you've brushed (morning, afternoon, evening) and for how long, and also makes a note of whether you were too heavy-handed at any time during your session, and any optional extras you may have performed, like flossing. You can backtrack through this data and see your session history presented as lists and graphs, but really, what's the point of it all? Aside from chasing personal bests, achievements and trophies the app awards you for brushing consistency and using all the features, the information it records is devoid of any real meaning. You're not offered any kind of feedback, probably because it would be irresponsible to base advice on the lone metric of how long the brush head spins for. So, you're essentially left with an iota of data that has so little value, I'd argue staring into space is better for your mental health than reminiscing about Wednesday's evening brush. And if your session history is useless, what's the point of the app in the first place? It's busy with features, sure, but it's almost as if these are planted to conceal the fact it doesn't really do anything. I'd imagine you don't actually need a phone to remind you to brush at least twice a day, or tell you what dark corners of your mouth need extra scrubbing, or keep a record of what dentist you're registered with, et cetera. And since you set the app up manually, all it's doing is regurgitating information you provided in the first place. When it comes down to brass tacks, the app is about compliance. With an on-screen timer, you're more likely to spend the recommended two minutes attending to your pearly whites each time you brush. But therein lies another problem. 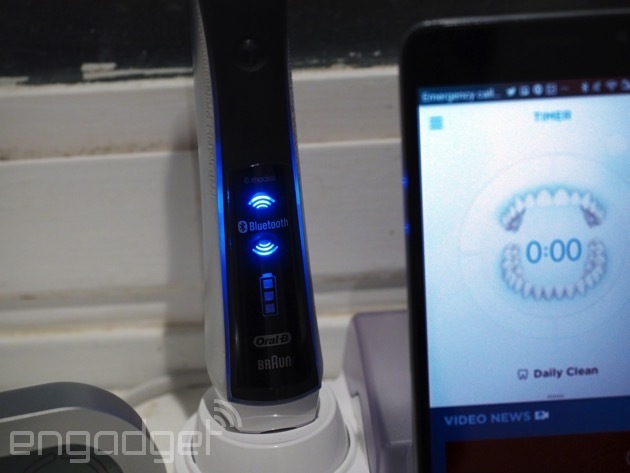 Oral-B has been bundling what it calls a wireless "SmartGuide" with its higher-end electric toothbrushes for years, and it works just like the app. The monochrome display of this compact peripheral won't give you the day's headlines, but it'll act as a countdown timer and tell you when to move onto the next quadrant of your mouth using a simple circle to demonstrate. It'll show what cleaning mode your brush is in, display a cartoon frown face if you're using too much pressure, smile at you when you're done and give you a star rating based on brushing time. Using a SmartSeries toothbrush as intended requires discipline (remembering to take your phone to the bathroom) and courage (the bathroom is a dangerous place for phones), but really there's no need for either if you have a SmartGuide by the sink. Unfortunately, US consumers don't have a choice, as the Pro 5000 doesn't come with a SmartGuide. The little peripheral is included with both UK models, however. The SmartGuide doesn't have a long attention span, though, so right now at least, you need to have your phone with you if you really are desperate to log those minutes. The handle is supposed to store up to 20 brushing sessions you can sync with the app later, but this doesn't work for me, and looking at all the angry reviews of the Oral-B app on Google Play, I'm not alone. Let's say you have neither your smartphone nor the SmartGuide on hand. Not to worry, because the toothbrush handle vibrates at 30-second intervals (prompting you to change quadrant) and buzzes violently when two minutes are up. The vibrations are accompanied by a green flash of light from the handle, which'll also glow red if your technique is too forceful. So, you don't really need the app or the SmartGuide, because the brush handle itself is built with compliance in mind. Maybe I'm being too dismissive, and maybe some of you legitimately want a record of your brushing habits. If that's the case, then simply go download the free Oral-B app and skip the expensive toothbrush. As a back-up measure in case Bluetooth isn't working as expected, the app will start the timer if it hears the buzz of an electric toothbrush coming through your phone's microphone. Theoretically, then, if you already own an electric toothbrush, you don't need Bluetooth for the app to work "wirelessly." And if you prefer the manual brushing experience, you can start the timer by hand and get your motivation/stat fixes that way. So even if there were a need for such an app (which there isn't), you don't have to buy an over-engineered toothbrush to go with it. That's not to say smart toothbrushes don't have their place, though. Imagine if the brush head could analyze tartar and plaque levels, or the quality of tooth enamel -- now that's data you can actually do something with. A silly fantasy, maybe, but even now there are firms cooking up smart toothbrushes that have real benefits. Kolibree, for example, is developing a connected toothbrush with an app that does all the boring stuff Oral-B's does, but with games. The idea is the toothbrush becomes the controller, encouraging kids, small or big, to do the unthinkable: scrub their teeth for more than 10 seconds. These days, every step needs to be counted, every sleep cycle monitored and every mundane new product needs "smart" functionality. With the SmartSeries range, it feels like Oral-B scrambled to make something it can attach a bunch of buzzwords to without considering the value to consumers. It's understandable in an industry that survives solely on adding gimmicks like tongue scrapers and "ActiFlex" bristles to up-sell simple necessities, but if your product is less useful than HAPIfork, you're doing it wrong.